Westworld intrigue deepened with the third episode, “The Stray,” and below showrunners Jonathan Nolan and Lisa Joy took our burning questions — including addressing the latest hints about the park’s mysterious location. Entertainment Weekly: Congratulations on the strong ratings out of the gate, plus seeing all the Westworld references being made during a presidential debate when a fly landed on Hillary Clinton’s face must have been pretty surreal for you guys. Lisa Joy: Someday we’ll have to tell you about the fly wrangler story, and of all the difficulty of getting those [fly-on-face] shots without actually hurting any flies. So after Bernard gives Dolores a copy of Alice in Wonderland, I looked up images of Alice from the animated movie and feature films and, sure enough, she has long blond hair, little bit of curl, baby blue peasant dress. So beyond being a metaphor for Dolores, that’s how Dolores looks. That’s intentional, right? Jonathan Nolan: There are a couple of references for Dolores. Some more explicit than others. Alice is one we talked about. 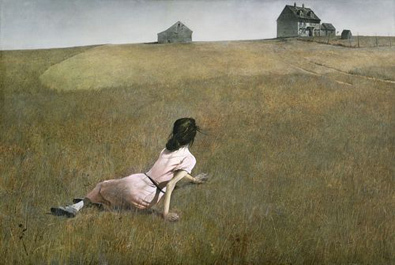 But also Andrew Wyeth’s painting Christina’s World. It was a tilt of the head toward all the different stories that inspired us; a classic protagonist who’s on a hero’s journey with a darker twist to it. She starts in what should be the happy homestead but it’s not and she goes out looking ultimately for herself. Trish Summerville designed her amazing look for the pilot. She also looks like a Disney princess. She’s also got a leather belt, which is her utility belt. Joy: It’s feminine, but also striking and unique. Nolan: And when we find her, she’s already a capable a country gal. She’s explaining to Teddy how to wrangle cattle. She’s a formidable person in her own right, even if she’s missing the bigger picture around her. Speaking of her being formidable, I’m getting the impression that Dolores — who is very advanced in some respects but child-like in others — is filling a hole for Bernard left by the loss of his son in their conversations. That he’s reluctant to halt her development, the way his son’s was halted in death? When he sharply asks her why she asked about his son, was he suspicious in that moment she might be manipulating him? Nolan: He’s trying to understand what’s happening in terms of her consciousness. In that moment where she responds that it’s been some time since she asked a personal question … it’s a let-down moment that she’s still very much a machine. He was wondering if she’s actually curious. Joy: He’s trying to see if there’s real empathy there. So we see here Dolores diverting from her loop in major ways. And if I’m reading this right, first scenes from past lives were showing up in the hosts’ dreams, but now with the scene at her ranch it seems like she’s starting to see them while awake as well? Joy: The relationship with memory is something we’re exploring. Yes, you’re first seeing Maeve access them in her dreams, and now Dolores is having flashbacks. Something in her mind is remembering different versions of it. We have a revisit of the barn scene. Dolores, we assume, was basically programmed as a nonviolent character and that’s why she couldn’t fire a gun, and that by pulling that trigger, that’s a new way she was able to break through her programming? Joy: That’s exactly right. The techs are always trying to test for if a host has breached, if they’re off their loop, if they’re doing something unscripted. That’s why Bernard asked that question earlier, to see if she’s improvising in a wholly new way. And earlier we saw she wasn’t improvising, she’s still couldn’t pull the trigger with Teddy even though she’s increasingly questioning her desires. Then you get to the end of the episode and she does this big reach — she fires a gun she shouldn’t be able to fire. Is there a reason Dolores told that “violent delights” code to Maeve but not to Teddy, who could use some waking up if he’s ever going to run off and elope with her? Nolan: I think that’s good question to be asking. Nolan: We love Luke Hemsworth, who plays Stubbs. He’s a lovely laconic guy and that’s been infused into the character. The [usual way of portraying] a security officer is he’d be a disinterested dunderhead. But Stubbs actually knows a lot more about the park. As you said, he’s correctly diagnosed what story he’s in well ahead of the other characters. The stray sequence is full of various mysteries that you might not want to get into yet — where’s this host going, what’s that drawing, why did he attack Stubbs. So I’ll just throw it as an open question to you: Is there anything you want to say about that sequence? Nolan: It’s less that he’s trying to get out of the park than trying to get up to the top of the mountain. That’s odd behavior. We also like the idea that an artificial mind might break in different human minds. I’m a huge fan of John Frankenheimer’s films, like The Manchurian Candidate. The idea that you have hidden purpose in a brainwashing movie. We talked about it endlessly. Brainwashing in human beings is always a little far fetched. With the hosts, of course, the idea of having hidden purpose, or break in ways that are inhuman, is completely believable. Everything they’re doing is brainwashed, in a way, with some exceptions, like Dolores. The question is: What have they been told to do? And by who? We also learned about Arnold in this episode. Is there any chance we’ll ever see Arnold, in any form? Nolan: I think that’s likely. The 3D printing scenes of the hosts being created are also gorgeously created. Is that all CG? Nolan: The vast majority of shots of the 3D printing stuff is practical [effects]. There’s one or two shots where its all effects, but most of what you’re seeing there is practical with some beautiful finishing by our effects team. So there’s nothing you’re looking at that’s completely practical but very little you’re seeing that’s completely CG. We got a couple more teases about the park’s location this week. In the first, Bernard phones home in that Skype pod and notes it’s “tough to get a line out here,” so you assume his wife is a long, long way away. On the other hand, Bernard also made a reference to evolution driving all the development of life “on this planet” — which sounds like the way a person would refer to Earth while they were on Earth, not some other world that was settled. [At this, the showrunners laugh heartily, and I’m dying to know why]. Are these seemingly conflicting clues, or am I just reading too much into all this? Nolan: I remember when [executive producer J.J. Abrams] called after watching the original film. In my memory I conflated that hovercraft sequence when they arrive in the park with the space-hotel with 2001. And I said to J.J., “Is that park even on this planet?” The important thing for us was, when you come to the series you have no idea where you are. Disneyland is in a parking lot in Anaheim, but it’s spectacular and you forget where you are when you’re inside. By the end of the first season, if you’re paying close attention, you will know where it is. [There’s some offline chat.] Lisa disagrees with that, by the way. Joy: Regarding the comms, regardless of where they are, the park is very, very vast, and you don’t rotate home often. You don’t have open communication where you can just pick up a phone. Even senior people have to go to the coms room — because [the park is] protecting their intellectual property. We’re hoping to paint a portrait of the culture of the corporation. Nolan: We live in a post-Snowden moment. You look at this election, and Wikileaks and the Sony hack. If you’re not anticipating that your emails are going to be hacked, you’re not paying attention — they probably already have been. Clearly over the next 10 years, you’re either going to see a tilt toward everyone being comfortable with their personal and business correspondence being made public — which probably isn’t going to happen. Or you’re going to see the creation of much more rigorous data-protection schemes. In Westworld, the value of the park is all in its intellectual property, it’s all in the code. So regardless of the park’s location, they would be extremely careful with that code and making sure its virtually impossible to smuggle it out of the park. And there’s the privacy of the guests — you’re not going to have a good time in Westworld if somebody is Instagramming your activities. I’m amazed at Las Vegas has survived the Instagram age. In episode 2, when the guests come in, we don’t see this, but we assume these guys have cell phones that they’re not allowed to bring in the park. We very much think this is a path where culture may be going — that we’ll get over-exposed and sick of the interconnectedness of our lives that we’ll hunger for places [that offer disconnected privacy]. We’ll hunger for a moment where we can go back toward having some privacy.